A stalwart in the Chinese restaurant scene here in Singapore and an institution best known for its exquisite Cantonese dishes, Peach Garden is one that never fails to impress. Let Peach Garden at Hotel Miramar’s entice you with their new value-for-money promotion, where you can enjoy 50% off their A La Carte Buffet—that’s from S$24++/pax available daily both lunch and dinner! 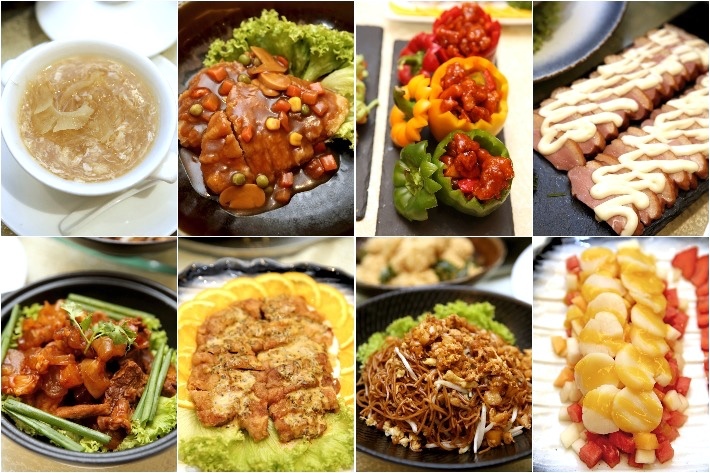 Quote “ladyironchef” upon making your reservation to receive a S$50 dining voucher (with $100 minimum spend). Peach Garden also has 2 exclusive lobster set menu promotions, where you can enjoy 50% off each set when you quote “Ladyironchef” upon making a reservation. For S$34++ per pax (after 50% off), you get to enjoy a bowl of Double-boiled Superior Abalone in Claypot, a lobster dish of your choice, Braised Tien Shin cabbage with Dried Scallop and Shiitake Mushroom, Signature Fried Jasmine Rice with Baby Superior Shark’s Fin and Chilled Mango Sago with Pomelo. These promotions are only available from now until 29 August 2019. 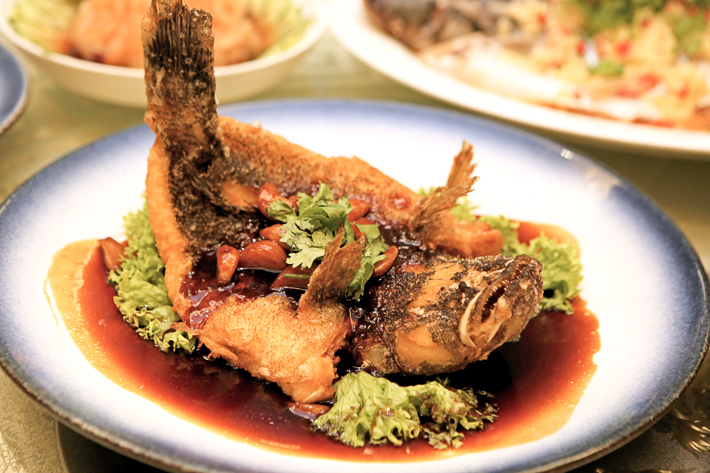 So, hurry on down to Peach Garden for a feast fit for a king (or an emperor)! Peach Garden’s A La Carte Buffet features a whopping 37 delectable Chinese delights that will undoubtedly leave you spoilt for choice. Start your meal off on a soul-comforting note with your choice of shark’s fin soup (limited to one order per person). There are five variations to choose from and our favourite is the one that comes with fresh crab meat and silky egg white. The soups have all been double-boiled to extract all those wholesome flavours without compromising on the quality of the ingredients. 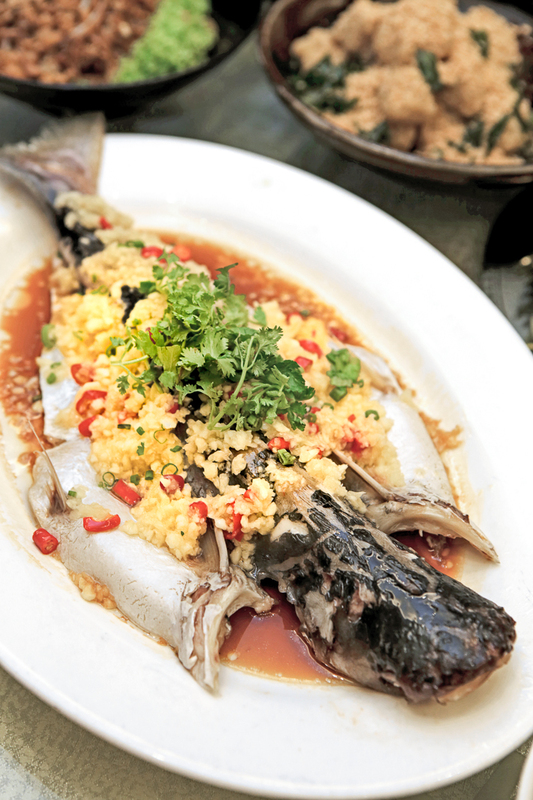 If you prefer your fish fried, their Deep-fried Soon Hock Fish (usual price S$80++) will not disappoint. Deep-fried to a beautiful golden brown, the fish sported soft, flaky flesh that broke apart with ease and was crispy from edge to edge. The simple yet robust superior soya sauce was of just the right consistency and added a nice savouriness and umami element which complemented the natural sweetness of the fish. It would be a crime to leave Peach Garden without trying their famous Steamed Live Pa Ting Fish (usual price S$80++) which has a firm, springy texture on top of being incredibly fresh. Slice through its meat like a hot knife through butter. Its copious garlic garnish enhances its fresh flavour that was devoid of fishiness and the muddy taste associated with freshwater fish. Their Live Prawns in ‘Indonesia Style’ (usual price S$28++) features fresh, chunky prawns that are simmered to perfection in a sinfully rich laksa-like broth. 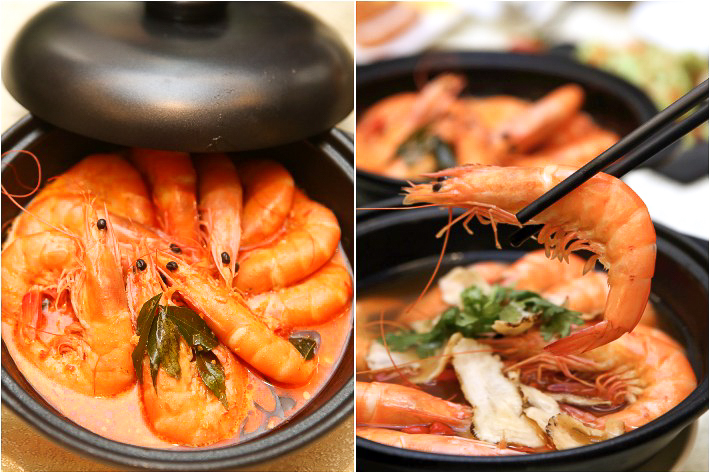 The other prawn dish consists of live prawns in a Chinese wine and herb concoction that has a slightly herbal flavour and a nourishing feel to it. If you are a frequent diner at Peach Garden, you’d know that their Deep-Fried Fresh Prawn with Wasabi Salad Cream (S$26++) is one of the best renditions you can find in Singapore. Here, the prawns come generously and evenly coated in an insanely crispy batter that gives the prawn a lovely crunch; but that isn’t the best part. 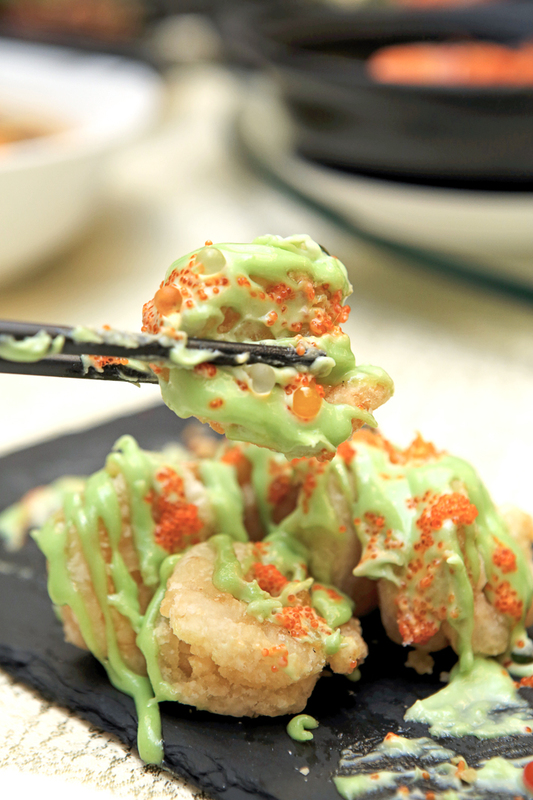 What truly elevates the dish is the wasabi salad cream which is tangy, sweet and spicy all at once. We appreciate how the wasabi was not too overpowering to the point where it masked all the other components of the dish. Another thing that we absolutely love about Peach Garden’s A La Carte Buffet menu is their extensive selection of meat dishes. 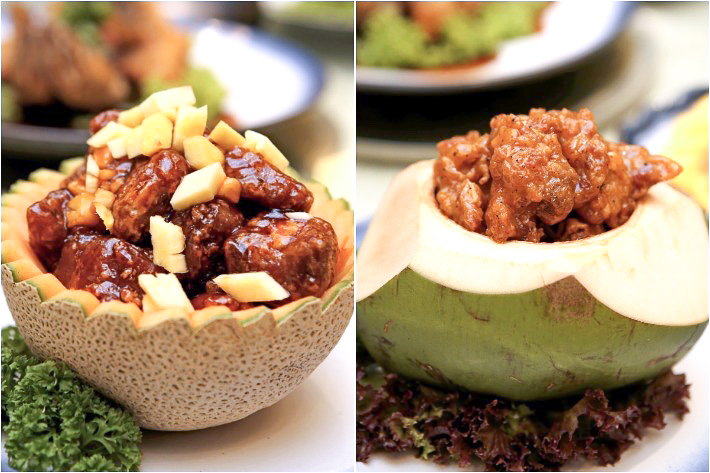 We enjoyed their Sautéed Sweet and Sour Pork with Lychee which was stuffed into a colourful combination of bell peppers, as well as their Baked Spare Rib with Pineapple Sauce. For something less sweet and more savoury though, their Braised Pork Belly with Mui Choy was very tender and soft with layers of fats. Fans of this premium crustacean are in for a treat with Peach Garden’s half lobster promotion. Upon purchasing a lobster (S$18++ for half lobster), diners can choose from over 18 preparation methods in terms of how they want their lobster done. Some of the flavours that you can expect are their Steamed Lobster with Superior Stock, Baked Lobster with Spring Onion and Ginger and Stir-fried Lobster with Fresh Crab Meat and Crab Roe. 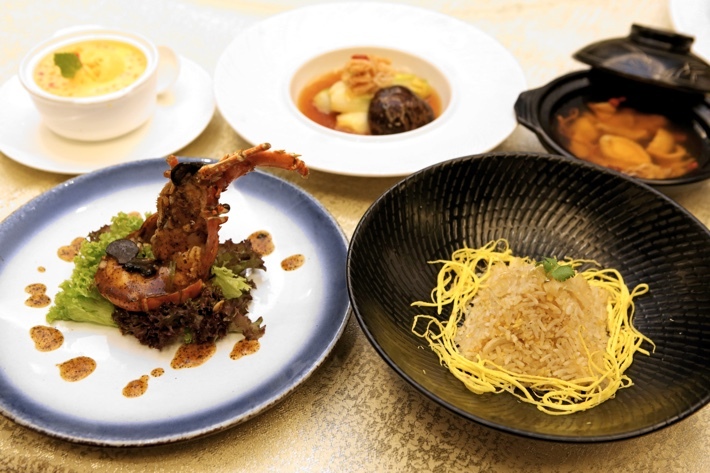 If you’re craving something more out of the box, there are also interesting options such as the Stir-fried Lobster with Black Truffle Sauce and Japanese Style Baked Lobster with Curry Sauce. 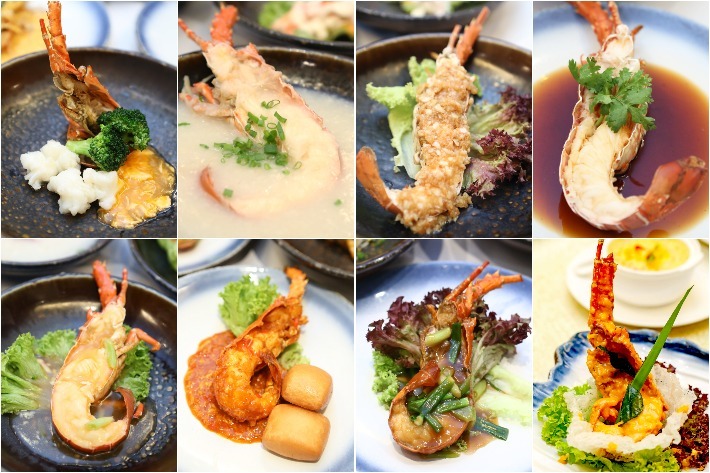 Among the plethora of lobster options to choose from, the standouts include their locally inspired ones such as the Lobster Popiah, Lobster Rojak, Baked Lobster with Salted Egg Yolk & Crispy Milk and the Lobster with Chilli Crab Sauce. If you haven’t gotten off the salted egg bandwagon, you’ll really enjoy their Baked Lobster with Salted Egg Yolk. Here, a creamy layer of custardy salted egg sauce evenly coats the entire lobster and provides it with that familiar, addictive savoury flavour that we all know and love. Another noteworthy dish is their Lobster with Chilli Crab Sauce, where the lobster is doused in a sweet, savoury and spicy chilli sauce. The sauce is made even better with the addition of egg, which not only helps to thicken the sauce but provides it with a full-bodied flavour. Exclusively for our readers, you can quote “Ladyironchef” upon making a reservation to enjoy 50% off one of their 2 exclusive set menus. Set Menu A (S$88++ per pax) comprises of a bowl of Peach Garden’s Signature Buddha Jump Over the Wall, a lobster dish of your choice (from 18 preparation methods), Roasted Crispy London Duck, Stewed Beetroot Noodles with Fresh Scallop and Double-boiled Crystals – Chilled Avocado with Ice Cream. Set B (S$68++ per pax) comes with a bowl of Double-boiled Superior Abalone in Claypot, a lobster dish of your choice (from 18 preparation methods), Braised Tien Shin cabbage with Dried Scallop and Shiitake Mushroom, Signature Fried Jasmine Rice with Baby Superior Shark’s Fin and Chilled Mango Sago with Pomelo. With these two set menus, you do not even have to choose. All the best items are put in the set for your enjoyment. You are guaranteed the bestsellers of Peach Garden. And a 50% discount means enjoying those luxurious dishes without breaking the bank. The value, especially for Set B, is unparalleled. After the 50% discount, you only have to pay S$34++ per pax and you get an array of premium seafood, including abalone and lobster. That’s a deal that your mother won’t miss the world for! 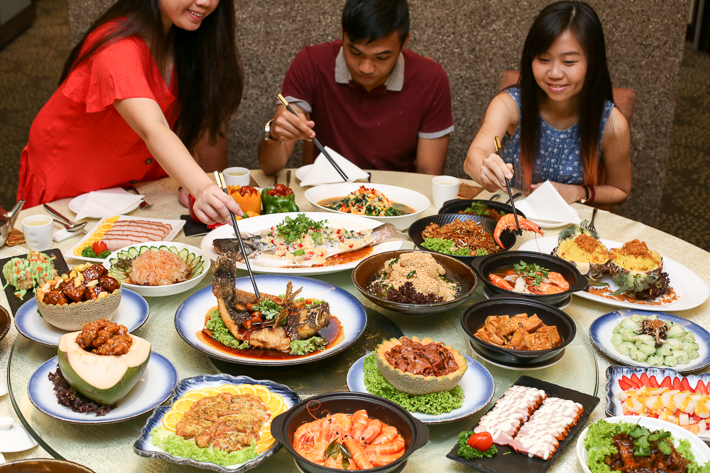 Do note that each set meal requires a minimum of 2 pax on weekdays and 4 pax on weekends and cannot be used in conjunction with any other discounts, offers and credit card promotions. All lobster promotions are also only available at Peach Garden at Hotel Miramar for lunch and dinner, only for dinner at Peach Garden at The Metropolis/Chinatown Point/NTU. This post is brought to you by Peach Garden.